How far along - I am 28 weeks and 4 days today. It’s funny as some of the pregnancy sites say your third trimester starts at 26 weeks and some say it isn’t until 29 weeks. I’m going to go for 28 weeks as it’s kind of in the middle. Size - Baby is apparently the size of a cantaloupe melon now!!! I’m definitely starting to feel a little more uncomfortable at times as he is getting bigger but so far it’s not been too bad at all. Movement - This little man is such a strong kicker!!! 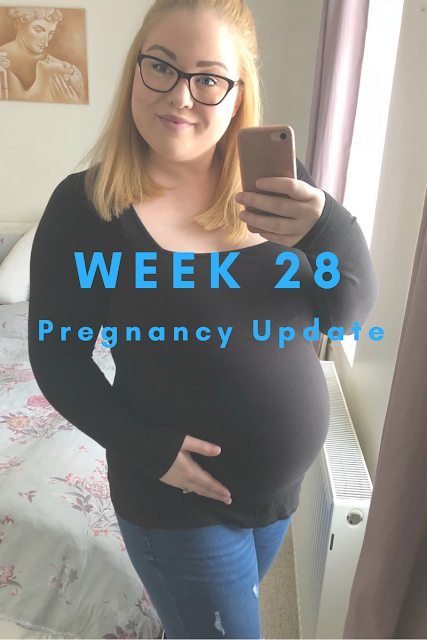 He has been breech for quite a lot of this pregnancy which has meant that a lot of the kicks have been really low down which has been SUPER uncomfortable! It has also meant that hubby hasn’t been able to feel that many kicks BUT in the past couple of weeks baby has been flipping around and the other night Hubby felt some kicks and couldn’t quite believe how strong they were. I think he finally understood why I’ve been moaning about some of the low down ones being really uncomfortable :) overall though this little boy is really active and I’m sure he is kicking a lot more than what I remember Pickle doing. Sleep - Sleeping has been surprisingly good! I’m able to drop off to sleep really well and have been having no problems getting comfortable of a night time. The only thing I’ve been finding is that I’m waking up at around 2/3am and having to go for a quick wee but after that I will fall straight back to sleep again. I’ve also noticed that sleeping on my side hasn’t been an issue. I’m not sure if it’s the pillow I’ve got or if it’s just my body but if I fall asleep on my left side I will wake up in the same position. I am having to switch sides through the night has I get a little achey laying on just the left side but it’s not an issue. Symptoms - This is a really interesting one as when I was pregnant with Pickle I was signed off by this point in my pregnancy. I had SPD, carpel tunnel and was generally having a really tough time with it. This time round it is so different. I haven’t had any SPD, which I am so pleased about, and I’ve been feeling really good. The only couple of things I’ve noticed is that I keep getting little bouts of sciatica in my left hip but I think that is when baby lays in a certain position and I’ve been getting Braxton Hicks. They aren’t happening that often but they are definitely happening every now and again. Apart from that I have felt pretty good and am having to remind myself that I do need to slow down a little bit as I’m still doing everything that I used to do. How I am feeling - As I mentioned above I am actually feeling pretty good. I’m getting myself organised now and we have brought a Snozpod, bottles, steriliser, changing mat, nappies etc and I’ve booked in to get the car seat and pram professionally cleaned next month too so we are pretty set. I’ve been feeling pretty emotionally good too. It’s like my hormones have finally settled down and I’m feeling normal. Anything else- This week is a busy week for us with appointments and scans etc but I am looking forward to it. I had my glucose tolerance test on yesterday, today we have a growth scan, lifestyle appointment (urgh!) and an appointment to see the consultant and then on Wednesday I’m seeing the midwife. It’s a busy week. I’m looking forward to the scan and seeing the consultant. So far my blood pressure has been pretty perfect. I am having to take it once a week at the moment and as of 32 weeks I will be taking it twice weekly but so far it’s good. I’m dreading the lifestyle clinic! I’ve got myself in to such a good headspace about my weight and my body and I am just dreading going in there and having my confidence ripped apart but hubbys coming with me for some support which I’m pleased about.